I didn't know then that the little white church in the mountains would become ours in such a deep way, the walls of that place forever burned into my history, the people there etched into my life like family. It was idyllic in so many ways, and I thank God for that little church from my childhood that gave me so much. One thing that church gave me was the realization that I could memorize Bible verses. I knew I could already, since my mom taught us so many verses growing up, but I never knew before we attended there that I could memorize whole chapters of the Bible. I'm not sure I would have ever attempted it if it wasn't for a wise person who implemented a camp-tuition matching program and plenty of competitive spirit to find out which kid could memorize the most. After I outgrew camp and started college, memorizing verses fell by the wayside for many years. With tests to study for and classes to attend, even through the summer, it wasn't something I spent much time on. Then the years rolled along, I got married, I had my babies. Last year, I picked up some notecards again and gave the memory verse thing another whirl by starting on the book of Hebrews. For a couple months I did wonderfully, and worked on the first four chapters - then life happened again, things got busy, and I admit I fell off the wagon. But those couple months of consistency made me realize something. 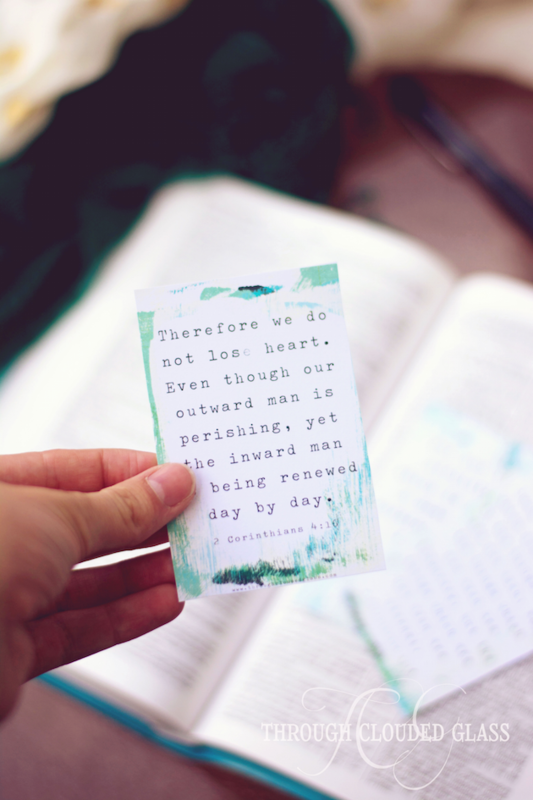 If you are struggling to deepen your walk with the Lord, one of the best things you can do is memorize Bible verses. Often my devotional time as a mom of young kids looks like trying to squeeze in reading a couple chapters and a quick prayer before someone comes into my room in the morning, tugging on my arm and asking for "bweck-fast". It's better than nothing, but let's face it, it's not the most fulfilling devotional season I've ever had. The Lord deserves so much more than five minutes in the morning that quickly fade from my mind, taken over by the busyness and frustrations of the day. Jesus wasn't getting the focus in my life that is His due, and I could feel it. But when I started memorizing chapters of Scripture again - and maybe not even focusing on anything else but that one chapter for a week or two at a time - all of a sudden, I remembered that God's Word is living and active. I could see in a deeper way how these verses all worked together, I could concentrate on the richness of theology that are contained in every line, and it became so much easier to see how it all fit into the here and now of washing dishes and training my children. Why is memorizing especially good for moms? The main reason is that you can review verses anywhere, anytime. When you have the verses all stored away in your head, you can pull them up and think more deeply on them throughout the day. You can pray over the things you are learning through a focused study on these verses - a study that you can do internally while you are driving, cleaning, or making dinner. And you start to notice the little things in life to which you can apply this Scripture that you have started to hide in your heart. It's like Bible study all day, instead of a rushed read-through for five minutes in the morning before someone calls your name (or rather, "mama" - which might as well be your name). Memorizing Scripture is something that I want to incorporate back into my routine as we head into this fall with a brand-new baby. With four kids under five, I know I am going to need that extra boost to keep my perspective, and memorizing verses is such useful tool for remembering that everything (even a seemingly insignificant mothering task) is building a more eternal weight of glory when these things are done for Christ. 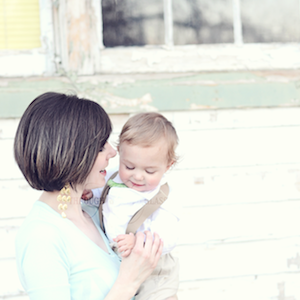 Do you struggle with your devotional time as a mom? 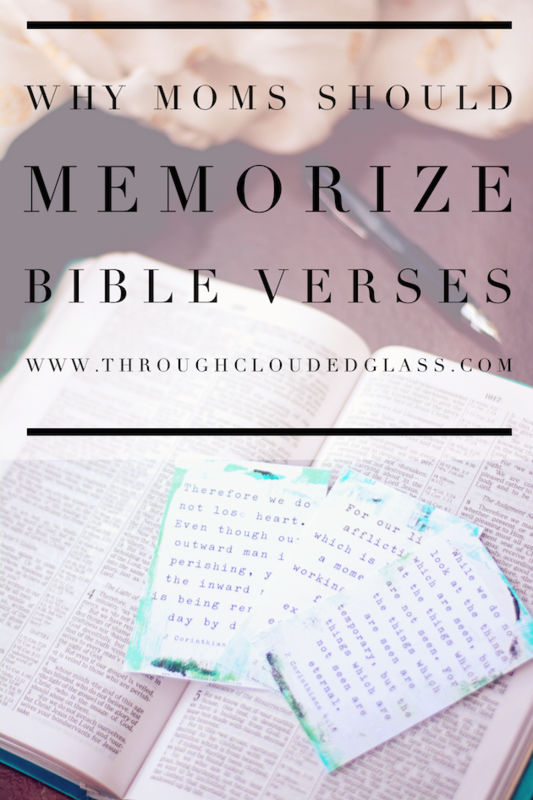 I want to encourage you to pick some verses to memorize! It's one of the easiest (yes, really) and most practical things you can do to focus on Jesus when things get busy (which is pretty much all the time if you have young kids). 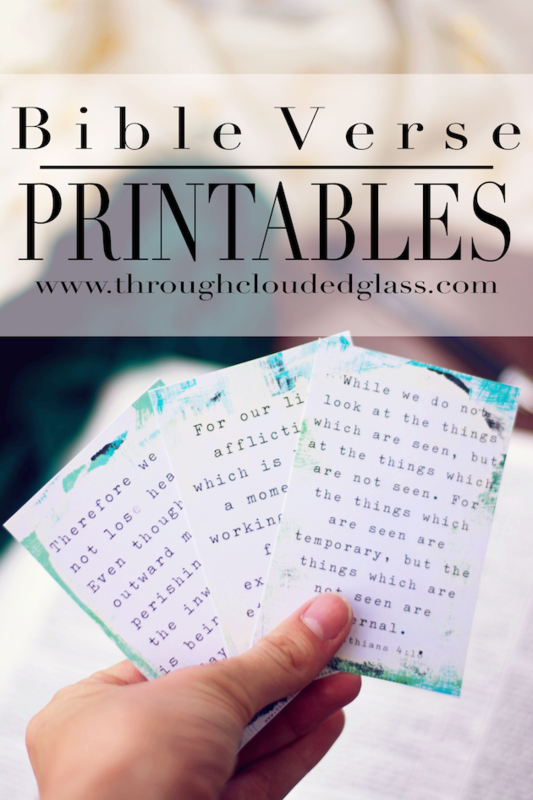 To get you started, I created these printable bible memory verse cards for those who are subscribed to my newsletter! Only three verses to get you started, but I am planning on including similar printable of some of my favorite passages and chapters of Scripture in my newsletters for the next few months! 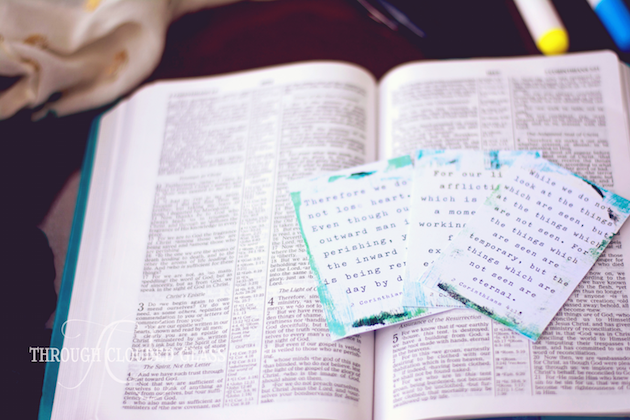 I so hope that you can use these to develop a habit of memorizing Scripture over the next few months - I know having pretty cards to work with helps me! Watch for future posts on tips and resources for memorizing Bible verses! What was the last Bible verse you memorized? Do you have any tips? This is such wonderful advice. I am going to add this into my morning routine so I can remember them all day. I'm more of a spiritual person, than religious, but I do pray and find that I get interrupted or fall asleep before I finish many, many times. Three boys will do that to a momma. 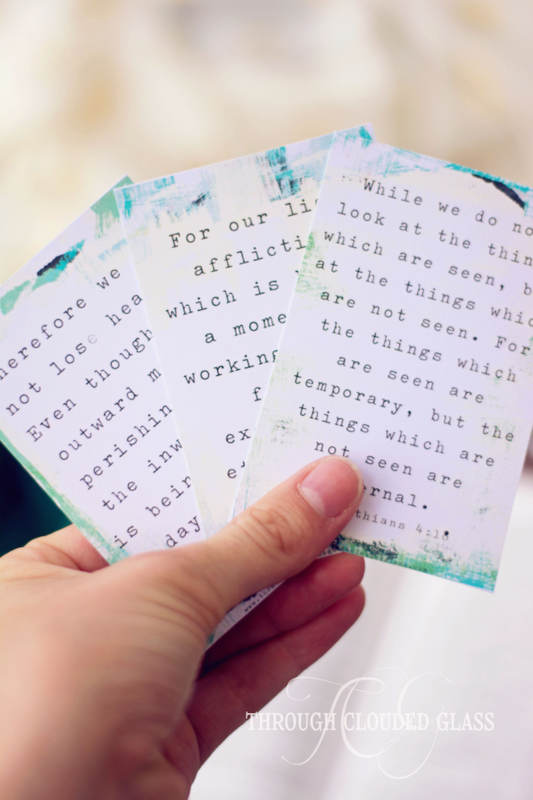 These cards are a really great idea, and it's so wonderful that you're making them for your readers. I totally agree that this has been the best! Scripture says to meditate on the word and what better way than through memorizing scripture. I have been loving learning verses with my 3 year old son via song! I subscribe to Seeds Bible Songs for kids, their mission is just like yours to increase knowledge of the Word through memory verses and if you look them up on Youtube and or buy any of their audios they take some of the most frequent scriptures, put them to song and make it super easy to memorize. I love your cards thanks for sharing.